Not a lot to say about today’s photo—I liked the shape, the colors and overall composition. The bud was in some shade so I needed a little flash in order to use an f-stop of f/8, which I need to give me the depth of field that I wanted. Camera settings: Nikon D3, Nikon 105mm f/2.8 shot at ISO 200, f/11 and 1/350th of a second with Nikon SB800 at camera left. Lightroom—Set black and white points, added clarity and increased contrast, and adjusted hue and saturation of green, red, yellow and orange. What's not to like? 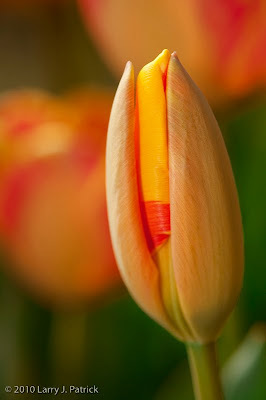 Good control of DOF, closeup details in bud and great colors. The rim lighting on the bud allows it to separate very well from the flowers in the background. Nice. The color combination reminds me of an impressionist painting rather than a photograph. Again, I would hang this on my wall. Beautiful photo. Get off the flowers. I do not want to see anymore flowers. Enough with the flowers. I have seen too many flowers. Do something else. Great colors and I like the depth of field on this one with more detail in the front flower. The flash really sets it off from the darker background. You have effectively achieved giving this photo a three dimensional aspect to this simple photo of a flower. I can see the roundness of the bud. Nice job on the lighting and the composition. Would like to hear a little more about how you used your speedlight on this one. Beautiful. I am not tired of your flowers. Looking at the three flower photos, it is hard to believe they all came from the same flower bed. They are all so different. As far as I am concerned, you can do flowers for a while longer. I like your flowers. Question - you used flash in order to use an f-stop of f/8. You listed f/11?? Would that not give less DOF than what shows or is it how you set it up? I am learning some Flower Power. I cannot tell you what is missing, but to me, something is missing from the photo. I like the colors and the lighting however I wish there was something else to the photo. David A. - He's using a Nikon 105mm macro lens which is capable of giving you a 1:1 ratio (life size) at a working distance of 6 inches. DOF when shooting this close is measured in mm and fractions of an inch. An aperture of F11 would give more depth of field than F8, but less light would be available, making the use of flash necessary to use that aperture. Based on what I know about Larry's experience, I'm thinking he mentally calculated F8 being what he would need before he actually metered. He knew F8 would be close. When he actually set up and took the shot it probably required F11 to get his exposure. Based upon many of your writeups and Doug's comments above, it seems that you do a lot of things in your head that you do not seem to put down on paper. I have never submitted a comment to your blog, but visit it daily. I would like you to write more about your thinking process. Example, what exactly were you thinking before you shot this photo. What is your normal shooting process. Thanks for all the information that you provide. It has helped me in my own photography. Bill has my vote. How do you see these photographs?